"Shape has been one of our top suppliers for more than 10 years, providing quality-products, and on-time delivery, especially in rush situations, where they demonstrate time and again how willing they are to dive in and help. One of Shape’s key strengths is their ability to custom design products that meet our rather demanding, and unique, requirements. We’ve had an excellent relationship, and we’re confident it will continue to be so for a very long time." "We are very proud of our more than 35-year relationship with Shape and truly appreciate their professional and refreshingly friendly and responsive approach toward service. With respect to products, we purchase custom ballasts from Shape for our medium pressure UV lamp systems, and are grateful for the engineering assistance we receive, which helps us design and manufacture the ultimate UV curing systems for the screen printing and label markets. We know we can always count on product reliability when dealing with Shape - in fact, many of our UV curing systems are still operating perfectly after more than 20 years in the field." "Our manufacturing company provides best in class products and customer service, and, therefore, our supply partners are an essential part of our business model. Shape, LLC is one of our most valuable suppliers, and for more than 25 years they have provided us with high quality transformers, design/engineering, and a supply channel that supports our lean manufacturing structure." 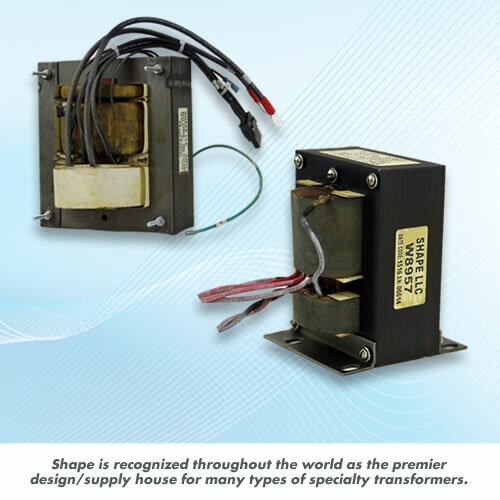 Shape is recognized throughout the world as the premier design/supply house for many types of specialty transformers, including ferro-resonant transformers (also known as constant voltage transformers). In fact few others can match our abilities with respect to design and application expertise, rapid product development, just-in-time manufacturing, and value-oriented pricing. Ferroresonant transformers provide relatively constant output voltage with less distortion using a wide range of input voltages. Shape provides Constant Voltage Normal (“CVN) transformers that produce a square wave output, and Constant Voltage Sinusoidal (CVS) transformers that produce a sinewave output. These transformers are commonly used for power supplies, battery chargers, lighting, inverters and more; and they help control brownouts, voltage sags, noise and distortion, and power surges.